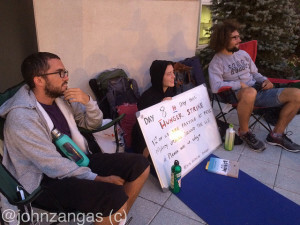 The hunger strikers, organized under the name Beyond Extreme Energy, have already attended public hearings; made comments on the FERC dockets; organized petitions; disrupted Commission meetings; protested outside of FERC headquarters for two full weeks with banners, props and art displays; and blockaded its doors, resulting in more than 100 arrests. 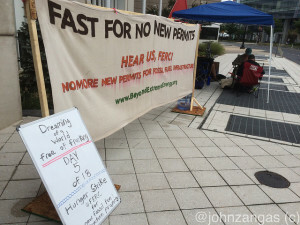 “There are so many ways to make a stand, from talking with our friends in church to fasting,” said Carolyn Shaw, 71, a retired educator from Middleton, CT, who joined the fast for four days last week at FERC. Their ages range from early 20’s to early 70’s. Many people around the country are fasting in solidarity for part or all of the time. By Day 5, everyone is rough around the edges. Their brains don’t work as fast, word recall is harder. The younger ones are feeling the pain more. By the end of the eighth day, the four youngest are suffering. 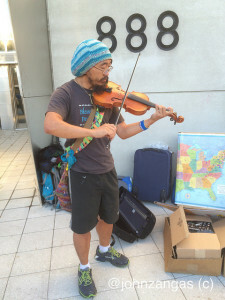 All of them–Lee Stewart, Jimmy Betts, Sean Glenn, and Mackenzie McDonald Wilkinson–walked in the 3,000-mile Great Climate March, but they agree: this is much more physically and psychologically difficult. “The Climate March was hard, but at least I could eat,” said Stewart of Washington, DC. He’s getting stomach cramps when he drinks the mildly salted water. They lay on sleeping bags with yoga mats underneath while the last Metro train pulls out of Union Station for the suburbs. Elder fasters peer into a future altered by climate change. They worry about the next generation, and the next, and the next. “I fasted [for] the imperiled future of my grandchildren, who will not know many of the beauties I have experienced in my life and will suffer from the effects of a compromised earth,” Carolyn Shaw said. Jerome Wagoner from New Jersey has three daughters, two grandchildren and “one on the way.” He fears his great-grandchildren will have a bleak future. “I’ve started to think if we don’t take effective action now, it will be irrelevant,” he said. 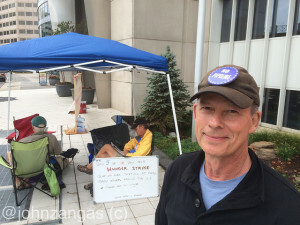 A FERC employee thumped his heart with his fist as a sign of solidarity as he passed by. “I am not supposed to talk to you,” another said over and over for 20 minutes as Ted Glick of Chesapeake Climate Action Network explained to him why they were there, told him about the pipelines and how they prime the pump for fracking. Passersby–including FERC employees–smile or ignore them, take flyers or push them away, offer feedback or pass in silence. Chairman Bay nonetheless stopped when Ted Glick flagged him down. By Glick’s account, Bay told him that he respected what they doing, and it reflected the commitment of their beliefs. I responded: How can we do that when there’s no change at FERC as far as permitting gas pipelines and fracking infrastructure, one after the other, with virtually no exceptions. His response: these are just pipelines. We’re a regulatory agency. Blaming us is like blaming the steel companies that make pipes. It’s the production of the gas that you need to deal with. My response: how can you say you have no responsibility for the expansion of fracking? Without pipelines and infrastructure the fracked gas industry couldn’t be expanding and the gas wouldn’t be sent around the world. And you have a legal responsibility to do environmental impact statements and assessments which address the climate and environmental impacts. You also are supposed to be acting in the public interest, not the interests of the gas industry. At that point, he checked out on the conversation, said something to the effect of “we should talk more,” and he headed off down the sidewalk. 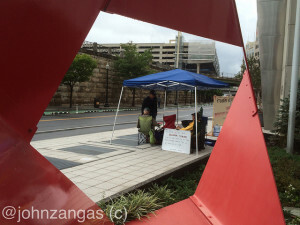 “The fact that they’re doing it shows that they realize that they need to be responsive. But this kind of responsiveness is just a sham, just really a sham,” said Glick. “An Interstate Natural Gas Facility on My Land? What Do I Need to Know?” is a 28-page brochure FERC offers to the public as a guide to its approval process. In contrast, at the beginning of October, FERC will hold its third three-day seminar this year for industry personnel on how to successfully navigate the FERC environmental review process. “Any alterations to FERC’s review process would be the result of legislative changes by Congress or by a rulemaking by the Commission. The Commission has not implemented any rulemakings with regard to its review process,” said FERC’s Tamara Allen-Young. Fasters are giving up “conveniences and routines” as well as food, explained Jerome Wagoner. “It has actually made me question my habits of eating, why do I eat as much as I do and would I get away with one meal a day?” He intends to become a vegetarian after he ends his fast. Charles Strickler admits to being a climate denier previously, but that changed after he and his wife volunteered in Biloxi for Katrina relief in 2008. “All of the climate denier scientists were being paid by the fossil fuel industry,” he said. 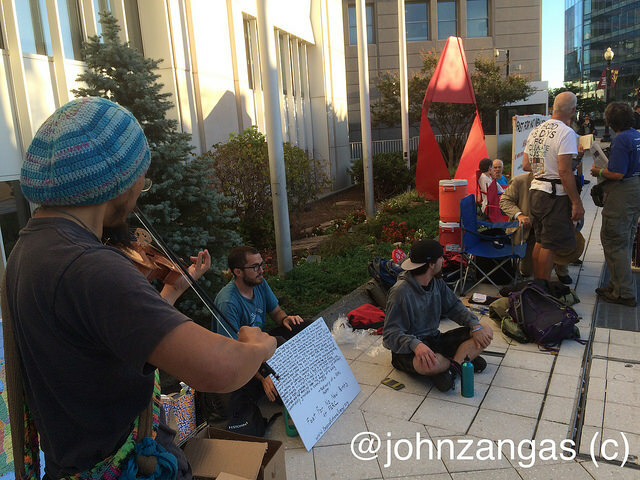 “Dreaming of a world free of fracking,” reads the white board in front of the FERC fast. It seems appropriate on the eve of the Pope’s visit to choose the civil disobedience tactic which overlaps with religious and spiritual purifying rituals.